I'm so sorry, this is an incredibly long, possibly boring post but I wanted to be sure to cover all of the details of washing vintage clothes. This is such an important topic because one wrong move can destroy a piece of fashion history. After my adventures in a clothing warehouse, I've been spending most of my time leaning over the bathtub, washing all of the old grit and grime out of my new clothes and I thought I'd share my experiences with all of you. Every time you wash a t-shirt or pair of jeans, the color fades and the fibers in the fabric break down. We've all had laundry disasters with modern clothing but an oops moment with a vintage dress can be devastating. I'm not a textile preservation specialist (although that would be an -awesome- job) but I've done my best to check valid resources on the topic of vintage laundry and fiber care. The number one rule for vintage laundry is: if in doubt, look it up or ask a professional dry cleaner. If you have any tips or advice on vintage laundry, please do share in a comment below! There are a lot of conflicting statements regarding vintage laundry and the best detergent/stain removers so I'm only suggesting products that I've used personally. The most important thing to know about washing your vintage clothes is knowledge of fabrics. I've learned a lot about fabrics through sewing or simply visiting a fabric store. Feel fabrics, read the label to see what it is and take notes. You can get tiny swatches of fabric and keep it in a notebook with cleaning instructions. Another way to determine what kind of fabric you're dealing with is through a fiber burn test. To do a fiber burn test, turn your garment inside out and try to find a little snippet of fabric along the hem or seam that you can carefully remove for testing without causing damage to the garment. You only need a tiny piece about 1/3 the size of your pinky fingernail. While standing over a metal or porcelain sink of water, hold the fabric piece with a pair of tweezers and light it on fire. This is easily done with a candle. Observe the fabric as it burns and note the scent that comes from the burning fabric. Use this chart to determine your fiber content. Washing- Cottons may be washed by hand and line dried or lay flat to dry. For linen, dry clean to keep fabric crisp or hand wash, no bleach and dry flat. Hand washing softens linen. Machine drying can shrink linens. piqué- stiff fabric of cotton. Pique is a woven fabric, often with raised geometric shapes. linen- light to medium fabric similar to cotton but more expensive. Washing: Dry cleaning is usually preferred. Hand washing is possible but use body temperature water and mild detergent. Lay flat to dry. pique- woven fabric, often with raised geometric shapes. Washing: Generally, people take wools to the dry cleaner but dry cleaning is not always the best option for vintage wools. If you opt for the dry cleaning route, take it to a good cleaner that someone has recommended or that you have experience with. Wool can also be washed by hand but it must be done carefully. Wool can be hand washed in Woolite or Eucalan. Agitating the wool too much can cause shrinkage too so be sure to just let it be. When removing wool from a wash basin, lift it carefully so the garment doesn't just hang there. Pulling on the fibers can cause them to stretch or break so wet wool must be laid flat to dry and blocked to keep its original shape. Test your wool garment's lining to be sure that it can be washed. It would be a shame to have a perfectly clean wool jacket with a shredding lining! Wool can be freshened up in many ways without washing it, see the "bad smells, mildew and nasty stains" section below for ideas to keep your wools in top shape. Washing- Many of these fabrics are made from different fibers so always try to determine your fiber content before laundering. Specific instructions are noted under some of these fabrics types. Crepe-light crinkled fabric, made of silks, wool or synthetics. Many vintage crepes can get really screwed up if they get wet. Dry cleaning is often best for crepes. velvet -soft piled fabric of silk, cotton or synthetic material. Hand wash, hang to dry. acetate- synthetic fiber with a silky sheen. Most vintage acetate garments need to be dry cleaned. acrylic- a synthetic substitute for expensive wool fabrics. Vintage acrylic may pill (get little lumps) in the dryer and may be itchy. If in doubt, hand wash and lay flat to dry. nylon- very light weight yet strong. Dries quickly and may pill up in the dryer. Hand wash nylon and hang to dry. lastex-yarn that has an elastic core wound around with cotton or silk or nylon or rayon threads, used in vintage girdles and other shape wear. Refer to washing vintage lingerie below. rayon- popular vintage fabric made from cellulose. Strong fabric with many different weights. Wrinkles easily and may stretch or shrink when wet. Dry cleaning rayon is often the best choice although some rayons can be washed by hand and lay flat to dry. I have a rayon dress that shrank just a bit the first time I washed it so now I dry clean it. rayon pique- woven fabric, often with raised geometric shapes. Before you take the plunge, its important to know that some vintage garments will fall apart if you get them wet. You can do your fiber test, check the label, use the mildest soap on the face of the earth and that thing will still fall to pieces. It happens...not often,. but it does happen. Again, try to use your best judgment and if in doubt, ask a reputable cleaner before laundering. Wash one item at a time in body temperature water. Vintage dyes tend to run or fade and could damage lighter fabrics if they are washed together. Use caution on multi-colored fabrics. Let it soak for about 30 minutes, making sure that the garment isn't balled up in the water. If there are spots that need extra attention, dab at them with a clean sponge. Avoid scrubbing or swishing the wet fabric around in the water. To rinse, drain the dirty,soapy water out and let the tub water run over the garment for about 5 minutes or until the water is clear. I use my removable shower head to give each garment a really good rinse. I use a gentle setting on my shower head. Be sure to get all detergent out of the fabric. Some fibers such as wool can become weak when wet, so if you lift a wet wool dress or knitted sweater by the shoulders and hang it on a line, the fibers may stretch and pull and result in a garment that doesn't fit like it did before. For heavy items, carefully remove the garment from the rinse tub or basin and lay it flat on a white bath towel. Colored towels may damage a while or light colored garment. Roll it up in the towel, gently squeezing out excess water, being careful to not stretch the fabric. You can do the same for most other garments. The fabric dye may stain your bath towel so I buy a few cheap towels to keep on hand for this. After the excess water is removed, it's time to dry it. With knitted items, heavy things and anything that may warp when drying, I always lay it flat. With things like light blouses, cotton dresses and durable fabric skirts, I hang them to dry. When drying an item, be sure that the drying surface is clean, dry and free of stains or dyes that may rub off onto your garment. I admit, I have a few plain, easy skirts and dresses that I drape over my stair banister or shower rod to dry but I always wipe the surface clean first. There's no point in washing a skirt to drape it over a dusty banister. I've washed vintage girdles and bras with excellent results by soaking them in warm water with soap, sponging spots down and laying flat to dry. Be cautious when soaking metal to avoid rusting. If any of your girdle elastic has dry rot, they may crumble in the water. If that happens, you can replace the elastic panels with new powernet and have a perfectly clean, wonderful girdle. Dry Cleaning is not always the best option for vintage clothing. Some garments can be completely ruined by dry cleaning. Dry Cleaning chemicals and heat used to dry clean can be very harsh on antique fabrics. Glues used to bind fabrics on wool suits can melt during the dry clean process, beading and sequins can fall apart, etc. Always use caution and take your garments to reputable cleaners that knows how to handle vintage clothing and ask them about their damage policy. If you're nervous or on a budget, you can do it yourself with a home dry clean kit. You don't have to dry clean something after every wearing. Just like machine washing your jeans, fabrics break down after every washing. It's a good idea to clean an item as soon as you get it, to get out any musty smells but after that, only clean it as needed. See below for ideas on keeping your clothes from needing that extra cleaning. When wearing clothes that are older than your mom or grandmother, you'll come across some...errr, interesting things. Smells of smoke, tissues in the pockets, odd stains and spots, body odor, rust and who knows what else! The following are tried and true tips that I have used or collected from other sources. I hope that they help you to solve your pesky laundry problems! Vinegar mixed with water has been used to remove odors but it may remove dye in fabrics as well, so test your fabric in an inconspicuous spot. Vinegar and water can be used to kill and treat mildew. Baking soda and water mixed in a spray bottle helps with odors but if you just spray the smelly areas, it may leave a water ring. Try it on an inconspicuous area and let it dry completely before doing it on the whole garment. Some people have had success by spraying the whole garment to avoid water rings. This is a good trick for wools and works well on body odor. Sunshine Hang a garment on a line in the sunshine all day (except white or light silk or wool- the sun may yellow them!). Sunshine will brighten white fabrics, remove nasty smells and kill problem mildew. Lemon Juice Fashion Era.com says this about rust "Lemon juice mixed with common household salt creates Oxalic Acid the traditional, but poisonous proprietary remover for rust stains. Commercial products like Zud also work on rust." Steam is a gentle way to de-wrinkle and freshen up your clothes. An affordable garment steamer or simply hanging in the bathroom during a steamy shower works wonders on many bad smells. Fresh Air You wouldn't think that the vile stench coming from that suit can be fixed with fresh air but it's worth a try! Many vintage garments have been stashed in a grimy basement or stuffy attic for the past 50 years. Hang it up, open a window and set it near a bowl of vinegar, which also helps to soak up the stink. Stain Removal Guide Although vintage and modern clothes are not treated equally, Chemistry.co for all sorts of stain removal ideas. As always, use your best judgment. Here are a few different detergents, soaps and cleaning products that many people have recommended for vintage laundry. Dryel- an at-home dry cleaning product, available anywhere that sells laundry detergent. I have heard of some people may have an allergic reaction to Dryel so if you're worried, you can try it out on a t-shirt first. I've used Dryel on many of my vintage dresses and have never had any problems. Whirlpool Fabric freshener- another at-home dry cleaning product, but this time it's a chemical-free machine. Bleach- I've read that some people will use a little bit of bleach to wash vintage but I'm too much of a chicken to try it myself. Bleach is so harsh and dangerous on modern clothes. If you need to whiten something, try the sunshine technique as mentioned above and try to save bleach for the last resort. Dreft- A gentle detergent, marketed for baby clothes I use dreft to wash my baby clothes. It's very mild and has a really nice, powdery/flowey smell. 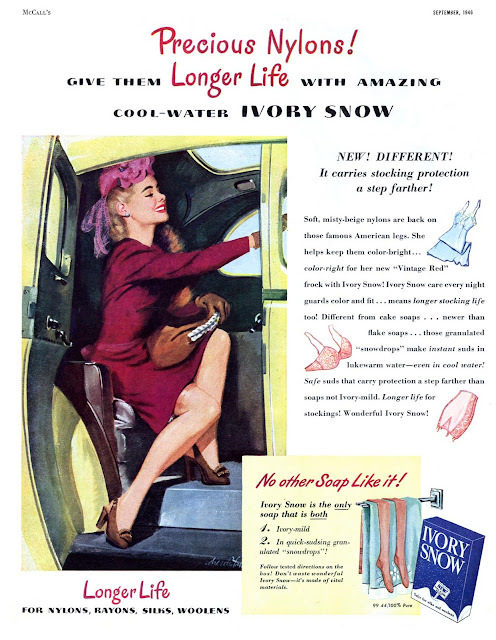 Ivory Snow- a gentle detergent for your delicates, sold in flakes and liquid form. It's my new detergent of choice. Oxyclean- I have used Oxyclean with success on almost all of my vintage items but it can be harsh so you must always be sure to rinse very well. Oxyclean must be dissolved completely and works best in hot water, which may not be best for all fabrics. It's best to not use it on rayons or silks but it's good on things like cottons. I've rescued many sad, filthy garments by soaking overnight with Oxyclean. That can be risky depending on the fabric, so always think about it before you dive in. Restoration- Antique and vintage clothing dealers swear by Restoration to clean antique textiles. It removes all kinds of bad stains and will not harm fabric. A baby toothbrush- a toothbrush for babies or toddlers has very gentle bristles and can be used to scrub a stained spot. A soft hair brush- a soft hair brush can be used to dust off clothes or smooth out the fibers on a wool garment. 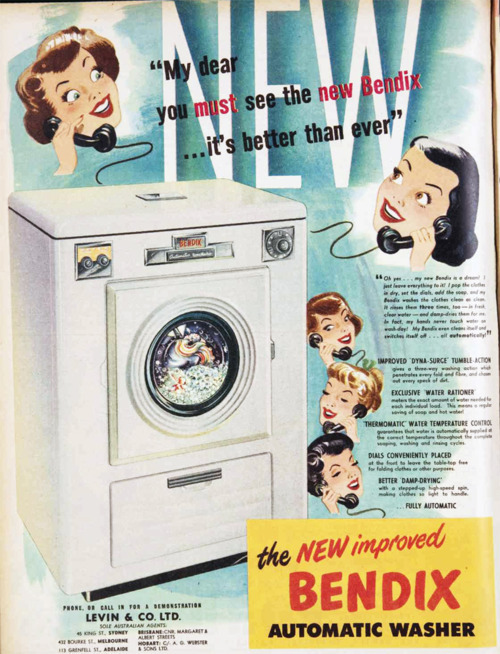 I'm so sorry that was so long-winded but I hope this helps with your vintage laundry day. Again, please leave any of your tried and true tips or advice on the subject in a comment below. Thanks and Happy Laundry Day! I'm super lucky to have a mother in law who is a professional drycleaner! She's always super helpful. One thing to remember about dry cleaning is that anything with beads or sequins can't be dry cleaned since they'll melt. Even expensive beaded wedding dresses won't be dry cleaned. Oh, you lucky duck! That would be awesome to have a pro cleaner to consult. I'd be bugging her all the time! haha! Yeah, I can't tell you how many times I've heard people (especially brides) complain about damage from a dry cleaner who tried to deal with beading. I still haven't had my wedding dress cleaned after 3 years cause I'm so worried about that beading! I was surfing and found where someone said to put clothing that can't be washed in a plastic bag with baking soda, shake it, and leave it overnight... it won't get the clothes clean, but will get the smell out of delicates without destroying the fabric (this also works for stuffed animals). After shaking the baking soda off, put them out in the sun. I read that febreeze actually has chemicals in it that will decay old material, and lemon juice and vinegar can be too acidic for very delicate old clothes. Last night I put the most delicate clothes in plastic garbage bags with baking soda, and shook them.... The mold smell had come out quite a bit. I'll be using your tips here to hand wash the ones that I can - hopefully this lovely weather holds! thank you for this article! I can't afford to do dry cleaning all the time and my wool skirts aren't that old, so i will be hunting down some dryel. Another way people freshen their clothes without washing is by putting the articles in the freezer! It's quite in Vogue to have raw jeans (or something like that, obviously I'm not with the times when it comes to modern clothes) so instead of washing, the jeans are put in the freezer. Great if you have the space! Another good fix for smells is full strength 100 proof vodka (the cheapest you can find) in a spray bottle. Give the garment a good spritz and the smells will evaporate along with the vodka. This trick is used by professional costumers on costumes that are worn (and sweated in) night after night. Thank you, everyone for the excellent tips! Ive used the freezer trick for really gnarly sippy cups but never thought of trying it on clothes. It obly takes a few hours for a cup so Im sure it would be great for clothes! I think I need to buy a deep freeze for my vintage! Haha! This is great, very helpful! Another cleaning option is 20 Mule Team Borax. It comes in a powered form that dissolves in water. It's gentle on fabrics and has tons of other uses! I've used it a few times on vintage whites and have had good results. I have cried so much when I ruined some vintage treasures!!!! Washing my vintage clothes is really what I fear the most except summer coton dresses of course! THANK YOU SO MUCH FOR POSTING THIS!! i have wished for a resource like this written specifically with vintage fabrics in mind. so helpful. Fantastic article, thanks for taking the time to compile this! Yes! Thanks for this! What a wealth of knowledge. Every bit of information helps. What a thoroughly fantastic, knowledgeable, vastly needed article. Amazing piece, dear gal, thank you so much for the time and effort you put into this excellent post on laundering vintage clothing. What a fabulous article, thank you! Thanks for the great article, very thorough. Now if I ever manage to find any real vintage clothes in my size (I need to make a shopping trip to st.louis, can never find anything plus size in my home town), I will know how to care for them. Will there be later articles on caring and repairing vintage shoes and hats? Hi, lynn! Yes, hat and shoe care is an excellent idea! I dont know much about shoe repair except to takethem to a shoe repair guy. Sometimes I have my crafty hubs try to reglue soles but thats about it. Hat care and repair is on my to do list, for sure! Wow, what a thorough post! In response to another comment - old sequinned dresses can't be cleaned because early sequins were made of gelatine and dissolve in water! Plastic beads may also melt if high heat is used, but no harm should come to glass beads. Oh, thats so interesting about early sequins! I had no idea! Very interesting and well informative! Thank you for the mention as well! Knitters tend to stay away from Woolite as it is not always the best option for handknits (not as gentle as it would lead you to believe and I am not fond of the smell). Aas a result, I rely on soaps specifically designed for handknits (and use the same on vintage woolens, knits and delicates). I recommend Kookoburra (http://www.kookaburraco.com/) and Soak (http://www.soakwash.com/). Help...I have a FABULOUS vintage dress from the 50's or 60's that belonged to my grandmother. Fortunately, she never threw things away. UNfoturnately she was a smoker. The cotton print dress has been heavily embelished with GLUED on glitter. Is there ANYway to safely wash this cotton dress without it becoming a gluey gopping mess....or becoming totally unsalvageable?? Brilliant comprehensive guide. I hand washed a 1970s cotton print dress and unfortunately some of the colours have run, even though I used barely luke warm water, the same thing happened with a FABULOUS silk suit... i used an extremely gentle detergent, do you have any tips for washing colours, esp with delicate fabrics? ty! Some of my dresses bleed a little bit so I wash them by themselves, as described above and rinse thoroughly before drying. I avoid letting them soak too long to prevent dyeing the light colors in the print and before drying, I roll them in a towel to get most of the dye-run out. Some dye run can't be prevented so you can also try dry cleaning. Good luck, hope that helps!! This is a helpful post! I was wondering.... I'm a bit nervous about makeup and hats mixing. Some of my hat bands will surely pick up foundation when they rest on my forehead. Should I skip the makeup or is there some way I can prevent or clean the hat to take care of it? I just got a lovely green velvet hat, but I really don't want to ruin anything! If you maybe wonder how to remove mold or mildew from your old vintage clothing that was in a cabinet for a decades, visit this link : Mold and mildew removal from clothing . This site is great, and I tried some of the tips myself, and it really works, although there are some weird advices, but I get rid all of my stains on clothes following those tips. I just found a gorgeous vintage satin blouse. It looks like it may be part of a bridal outfit. It can be worn as is, however it is covered with tiny pale rust colored spots. Your wonderful post suggests washing satin in water, but some others say never to do that because it can react. Have you washed something like this yourself in water and removed stains? I'm not sure of the age, but I suspect it is 50's. Needed these tips today when working with some unknown fabrics. I just ruined an amazing teal/green wool 60's shift dress. I hear-by promise to never ruin a vintage treasure again! I will not be impatient and make poor judgments again when cleaning vintage dresses. I mean this dress was soooo fabulous! Now, it has holes and shrinkage. Do you know how I would wash a vintage Kimberly metallic yarn dress. I've been searching for a way to get the smell of cigarette smoke out of a beautiful vintage mens Cashmere coat with no luck. I've had it outside on the line for a couple days and that only helped a little. Still smells bad. Any suggestions? Can I spray febreeze on Cashmere?